For the past two years, I have felt the walls encroaching in on me. It’s been a slow, almost imperceptible creep, from a time one year ago when I thought, “Tiny glasses? I’ll pass,” to my current, inexplicable need to have one-to-three pairs for the summer. It is as Hazel Cills has soothsayed (soothsaid? ): one day we all must submit to tiny glasses, and my day is yesterday. 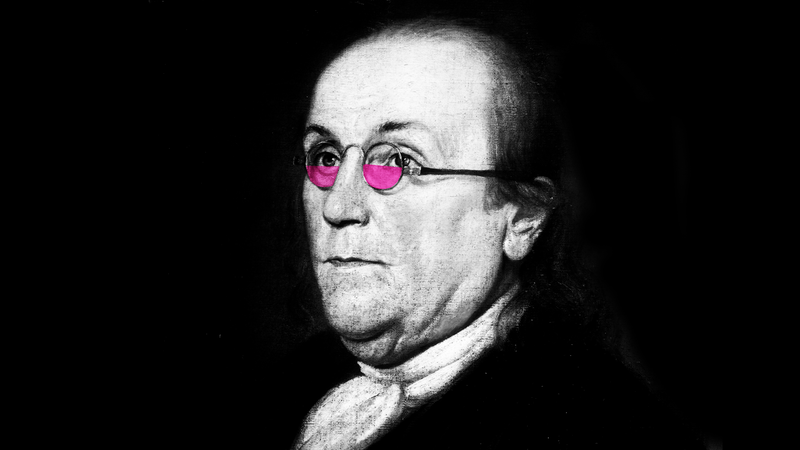 All this is to say that there is one fashion icon who has been a proponent of the tiny glasses trend years before it became cool, became uncool, and then became cool again—and such are the ebbing and flowing tides of fashion; even a broken lewk is fixed twice a century—Benjamin Franklin. The alleged womanizer invented not only the urinary catheter, but also the bifocal, meaning he, not Gigi, not Kendall, but Ben literally originated this look. Let’s honor a fashun forward legend. The Library (of Congress) is open and Benny is reading you for filth!!!!! Tip: For a special occasion, pair your weensiest specs with a three-piece brown velvet culotte ensemble!